Does reading a German Riesling label leave you scratching your head and running for the beer aisle? Too much information on a label can be daunting especially when the words are in German. What the heck does “Kabinett” mean anyway? Thankfully, there is a method to the madness. The many designations on the label are designed to be helpful so that you can select something that you will like. Once you crack the code you can be confident in what you are buying and even (to some extent) what it will taste like. The striking purity of flavor is one of many reasons to love Riesling. As an added bonus, these wines are often very low in alcohol, ranging from 8-11%. The versatility of Riesling lends it to many winemaking styles. The wines range from bone dry (no noticeable sweetness) to powerful honey-sweet wines. This wide range is one of the reasons that the labels contain so much information. The labels contain 6 types of information: Winemaker, Quality Level, Region, Village/Vineyard, and Ripeness. Typically the largest words on the label indicate the winemaker. The name may have the word “weingut” next to it. Weingut is German for “wine-estate.” Prominent German winemakers you may see are Joh. Jos. Prüm, Dr. Loosen, Selbach Oster, Fritz Haag and Zilliken. QbA stands for Qualitätswein bestimmter Anbaugebiet. Whew, that’s a mouthful. This simply means the wine is of average quality. The standards for making this wine are relaxed. The prices for these wines are very affordable. Keep an eye out for QbA wines from the Nahe Region, as these wines often offer outstanding values. QmP stands for Qualitätswein mit Prädikat. These are the real beauties of the Riesling world. In order to label a wine QmP the winemaker must follow specific requirements about where he or she got his grapes and at what level of ripeness the grapes were harvested. These wines can be pricey but are well worth it; offering a unique experience that most people bypass in favor of more well-known wines. QmP wines are the hidden treasures of the wine world. Just as the words Burgundy and Bordeaux conjure images of unparalleled quality and tradition, so too should the words Mosel-Saar-Ruwer and Rheingau. The regions are named after the rivers that run through then. The Mosel River twists and turns through ravines, meeting up with the Saar and Ruwer rivers along the way, which in turn follow their own courses. The grapes grow on steep terraces overlooking the water. The Rheingau region runs along the Rhine river. 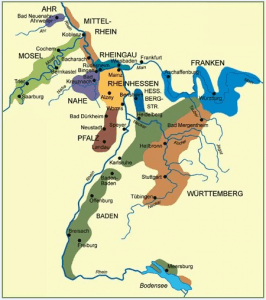 After 2000 years of experimentation, German vintners have proven these regions as the finest. You can tell the difference between Mosel-Saar-Ruwer and Rheingau wines in their taste and by the their bottles. Mosel wines are delicate and mineral-driven, often with a hint of slate. They also come in green bottles. Rheingau wines are fuller bodied, with more petrol notes. These wines come in brown bottles. There are many other regions but these are the finest and best places to start when trying new wines. Many times, the label will contain a village name followed by the vineyard the grapes came from. Unless you have oodles of time on your hands there is no way to learn them all. Most likely if the wine is pricey and it uses a “village-vineyard” format, it’s a safe bet that the vintner has added the vineyard because it is particularly famous. Here are some examples: Piesport-Goldtröpfchen and Brauneberger Juffer- Sonnenuhr. Some labels may only have the village, in those cases, the price tag can be indicative of quality. I saved the best for last. The easiest way to shock and amaze your guests is to actually remember the words indicating the levels of ripeness. Stated simply, the words listed below indicate how ripe the grapes were at harvest time. Riper grapes were picked later in the growing season, usually all from the same vineyard. Generally speaking, the riper the grape the sweeter the wine it makes. This fantastic nomenclature allows you to pick the sweetness level you enjoy the most. Although the wines can be very sweet, they are never sickly sweet. This is because German Rieslings have an intense acidity that balances the sweetness perfectly. I have listed the levels of ripeness in order of driest to sweetest (which is also typically the order of least expensive to most expensive). Note that there are some Spätlese that may seem sweeter than Auslese, depending on the winemaker’s preference of how much grape sugar to convert to alcohol and how much sugar to leave in the wine. Kabinett – Refreshing and aromatic dry wines. They are picked first from the vineyard. Spätlese – Typically they have some noticeable sweetness and are picked later. 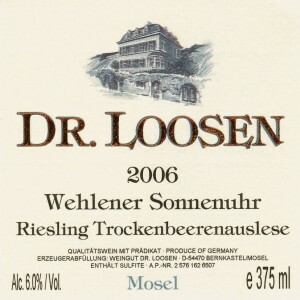 Auslese – Sweet and full-bodied, these wines can be expensive ($40 and up). They are harvested later in the season after the grapes have accumulated a substantial amount of sugar and perhaps some noble rot. Beerenauslese (BA) – Rare, intensely sweet and very expensive. The labor-intensive winemaking process dictates the high price. 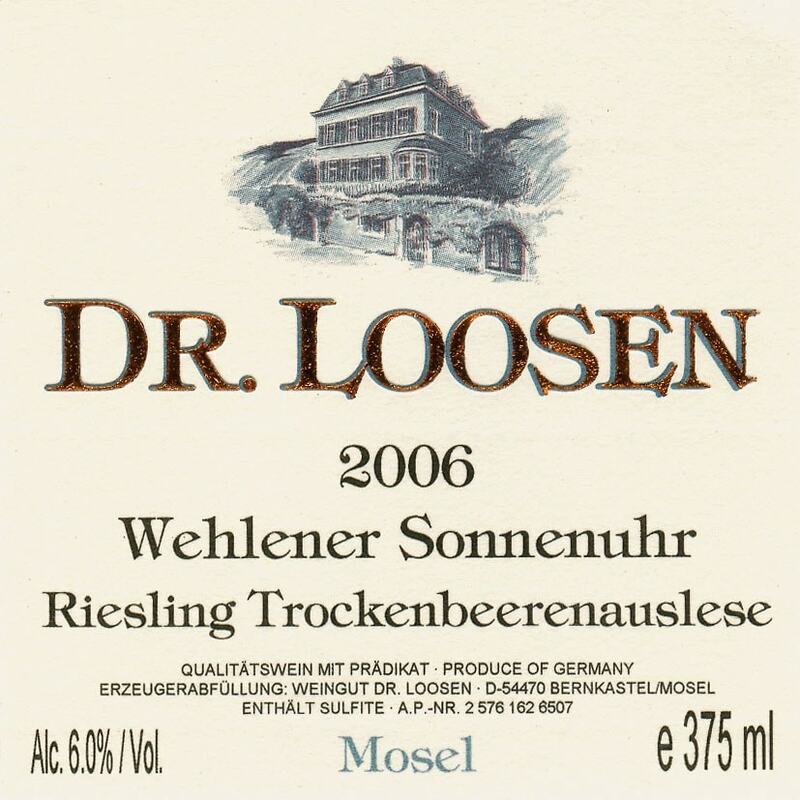 Trockenbeerenauslese (TBA) – The rarest, sweetest and most expensive of all, these wines are made from grapes after they have shriveled on the vine. They are carefully hand picked one berry at a time. More a nectar than a wine, these wines are only made in exceptional years – you can tell this by the price tag if nothing else! As for selecting a wine, try at least a couple so you can compare and decide which level of sweetness you enjoy. The 2007 vintage was exceptional with many wines just bursting with the aroma of fresh apricots. I would experiment with a couple from 2007 to get started. My personal picks are Trimbach Cuvee Frederic Emile Riesling (2007) and Hugel Riesling Jubilee Grand Cru (2007). Enjoy!